According to Art and Faith in Mexico The Nineteenth-Century Retablo Tradition, “The cult of Jesus’ physical heart of flesh originated in the Middle Ages. 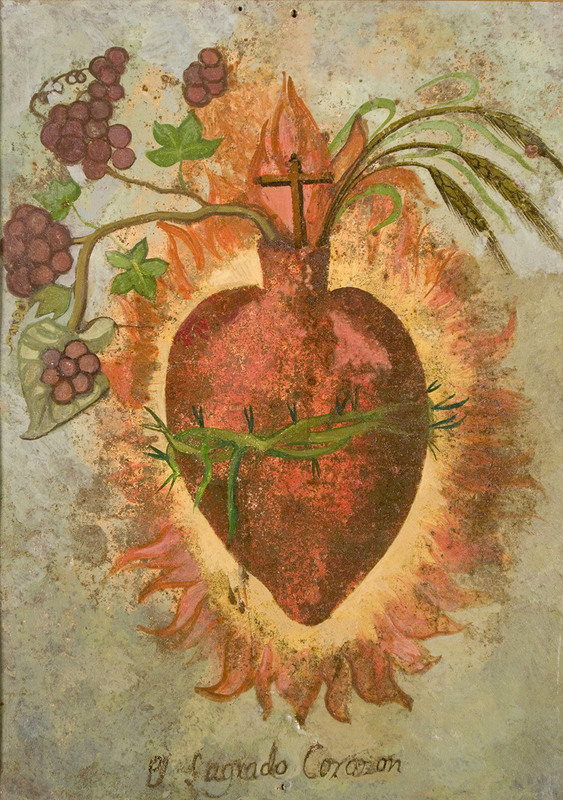 The pictorial representation of the sacred heart in Christian art appeared in the later part of the seventeenth century.” Spain introduced the cult to Mexico and by the eighteenth-century it was very popular, with a place for worship in the city of Mexitacán, in the state of Jalisco. The inflamed heart encircled by the crown of thorns is the symbol for devotion, sorrow, understanding, humanity, love and joy. The grapes and vine are the Eucharistic symbols of the blood of Christ, the cross for the crucifixion and wheat symbolizing the body of Christ. The Sacred Heart of Jesus reminds the devout of the true love of Jesus and His Sacred Heart as the source of His mercy, help, graces and blessings. In addition, believers are to have a special respect and veneration of the Sacrament and to make reparations for the neglect and indifference of so many to Christ.